The collective experience of displacement and harsh living conditions transformed Gaza into the crucible of Palestinian nationalism and the refugee return movement. The territory gave birth to the most significant vanguard political tendencies–from the Communist Party in the 1950s and 1960s, to Fatah in the late 1960s and Hamas and Islamic Jihad more recently. Self-governance–the crowning achievement of the Oslo Accords signed in the 1990s–became a way to alleviate Israel from the most “burdensome” elements of its occupation, while leaving it in ultimate control. When we add that the Fatah government in Ramallah, in the occupied West Bank, has cut spending on Gaza in recent years to pressure Hamas, we see that the protests are both a popular rejection of the occupation, the siege and the political crisis of Palestinian politics, and a way for Hamas to kick the “problem” of Gaza back to its rightful place–Israel and the international community, which are the main parties responsible for the perpetuation of the problem of Palestine for 70 years. 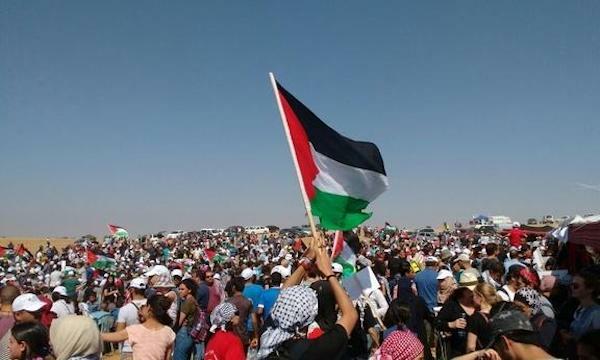 Having said this, the traditional structures of the Palestinian national movement–the Palestine Liberation Organisation factions, and Hamas and Islamic Jihad–have gathered around the new mobilisations and their organic leadership to form the Higher Committee for the Great March of Return, which oversees the movement and protests. So it is a combination of new and old actors, experimenting with new and old tactics. Hamas is still the dominant political player in Gaza, and its ability to mobilise forces is unmatched there. Its decision to abstain from governance essentially green-lighted its members to join popular mobilisations, providing numerical and logistical weight. This should not be confused with Hamas being the organisers of the demonstrations. Hamas is an organic actor in Gaza, and it is and will be a part of any mobilisation against the occupation there–whether it initiates these movements or follows them. The majority of Gaza’s workers used to work inside the Israeli labour market, and almost everyone was thrown out of work and imprisoned in the economically unsustainable Gaza Strip because of “peace”. A fence was built to hermetically seal the area in 1995–at the height of the peace process–seven years before Israel built its apartheid wall across the West Bank. My husband has been killed, two of my sons have been killed, another is in a wheelchair, and I don’t care if a bullet hits me through the forehead. Gaza is the most intense of the theatres because it is the least important for Zionist aspirations. Gaza is the territory that former Israeli prime minister Yitzhak Rabin–the Nobel Peace Prize winner–wished would “sink into the sea”. Meanwhile, we are witnessing unprecedented Arab state collusion with Israel–represented most vividly in Saudi-Israeli rapprochement, but also unprecedented Egyptian-Israeli collusion. Egypt has even invited Israel to bomb the Sinai with its fleet of drones to squelch the local opposition movements there. The Arab states seek to team up with Israel and the Trump administration to counter Iran–but also any perceived local opposition to their rule. These dynamics are debilitating for the Arab revolutionary currents, particularly without a larger progressive movement and network to sustain it.